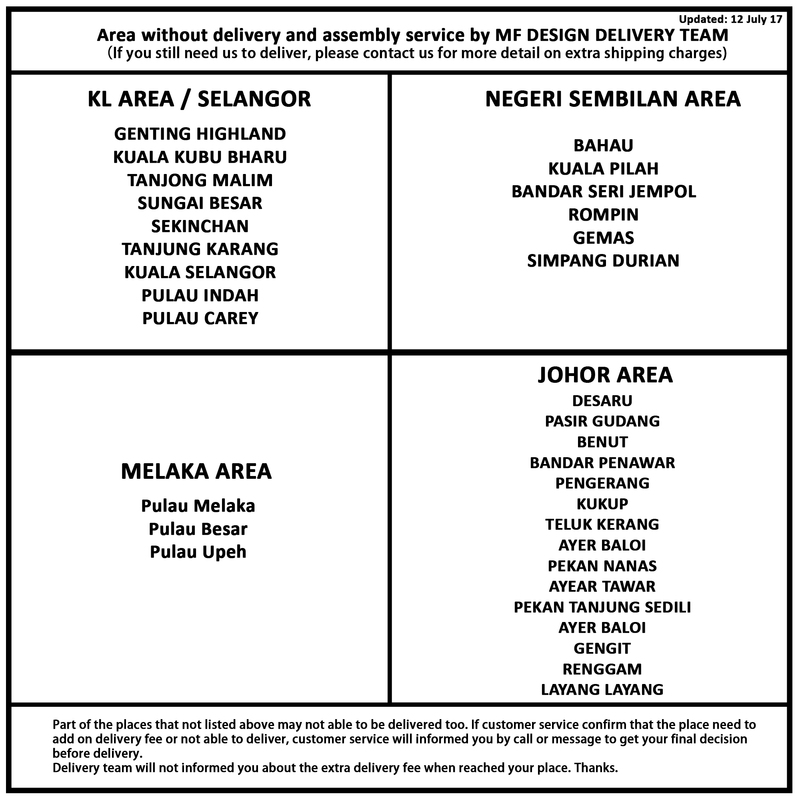 Free delivery on qualifying orders is only applicable to specific states which can be choose from product page and shown RM0 to specific state . Additional delivery charges may be incurred at the discretion of MF DESIGN FURNITURE should the deliveries be chosen to occur outside of our normal operating hours. In the event that a single order has to be split into various delivery dates/locations/timings due to special requests and/or selection of delivery dates within the stated delivery lead-time period, additional logistics charges will apply at the discretion of MF DESIGN FURNITURE. In the event that the goods cannot be delivered on your preferred delivery date and/or time-slot due to reasons such as lack of stock from suppliers or scheduling difficulties, you will be notified the soonest possible. MF DESIGN FURNITURE reserves the right to amend the delivery timings or to substitute the original item to a similar product of higher or equal value should such circumstances arise. For all of our delivery service, your delivery location must be accessible via elevator (i.e. on the same storey as lift landing) or must be on the same floor as the goods loading/unloading area. If the delivery crew is unable to send furniture to your location via the elevator at the point of delivery (eg. Furniture is unable to fit into elevator, elevator unservicable upon delivery crew's arrival, refusal of elevator access by building management etc) we will assess (at our own discretion) the feasibility of the furniture being carried up via the staircase in a non-hazardous manner. If the process is deemed hazardous, (e.g furniture or infrastructure prone to damage on narrow stairway, obstruction of passageway), In the event that delivery is deemed unfeasible, MF DESIGN FURNITURE reserves the right to cancel the delivery. Upon cancellation, a refund of any of your prior payments for that delivery will be made by cheque within two weeks from the initial delivery date. MF DESIGN FURNITURE reserves the right to change the delivery date and time should any unforeseen circumstances arise in the midst of delivery. While we endeavour to adhere to scheduled delivery timings and warrant to act within our means to notify you the soonest possible of any delays or difficulties, you acknowledge that you will, at no point in time, hold MF DESIGN FURNITURE liable for any inconvenience, losses, damages, injury, charges, expenses and/or deaths that may arise from any delayed, postponed, incomplete or unfulfilled deliveries, to the extent permitted by Law. Most of our products are delivered directly from the manufacturers' factories to reduce our overheads, so that we may pass on these cash savings to you with lower prices. If you have ordered more than one item, you may receive the items separately, and at different delivery times, though in most cases, we will arrange for all the items to be delivered in one truck. Should the items be delivered separately, you will be informed in advance. Changes in delivery date should be made via email to mfdesigncustomerservice@gmail.com at least 5 days before the stipulated delivery timing. Please provide your order invoice number, which can be found in the confirmation email sent to you. MF DESIGN FURNITURE shall not be liable for any loss of income, loss of profits, loss of contracts, loss of data or for any indirect or consequential loss or damage of any kind howsoever arising and excludes any liability from us for any personal injury or death caused by our negligence, to the extent permitted by Law.